Longdown Activity Farm’s prime objective is to allow all our visitors a unique experience of a close encounter with many domesticated animals. It is a working farm and our mission is to exceed our visitors’ expectations. We are proud to be a member of the Visitor Attraction Quality Assurance Scheme, and also NFAN, following their codes of practice. Longdown Activity Farm has built up a reputation of being very much a ‘hands-on experience’ attraction for every visitor and takes its adherence to the Equality Act seriously. The Farm allows a close encounter with as many animals as deemed safe and appropriate for each visitor, while taking into account Health and Safety for visitors and animals alike. The Farm is a working farm, therefore there are some areas where accessibility may be deemed restrictive however wheelchair access is possible throughout the main walkways. 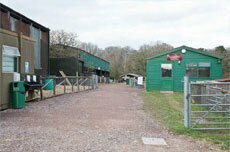 Longdown Activity Farm is situated on the edge of the New Forest National Park seven miles west of Southampton city centre and three miles east of Lyndhurst. Longdown Activity Farm is well sign-posted with the brown tourist signs from all major routes.. Nearest train station: Ashurst, New Forest. Situated next to the New Forest Hotel. The train station is a good 30 minute walk from us. Turn right onto the A35 and walk through Ashurst village, past the Co-op on your left, and following the road until you get to Deerleap Lane. Longdown Activity Farm is a 3 minute walk down Deerleap Lane, on the left, just past the church. Please contact us in advance to arrange a suitable landing space. We provide free car parking. The car park is situated on the opposite side of the road (Deerleap Lane) to the Farm’s entrance. The car park surface is compressed gravel therefore there may be puddles on the surface during and after wet weather. There are three disabled parking spaces clearly marked to the right of the car park entrance, which are situated 50 metres from the main reception. There is an overflow car park which is opened during busy periods however as this is on grass, it will not be opened during very wet periods. There is no artificial lighting in our car parks. Please take care when crossing the road. We welcome fully trained assistance dogs on site. For all other dogs we provide lockable kennels in the Farm’s car park. We do stress that these kennels are basic holding kennels and strongly recommend that you bring along a comfort rug and water bowl with you. You are welcome to check on your dog throughout your visit. We will inform the police of any dogs left in any vehicle which are in a stressed state! Access to our visitor entrance is via a concrete pathway; there is a gated access system to prevent children from running onto the road. The admission entrance is located under cover and is accessible to wheelchair users. There are no hearing loops installed at present. All pathways and buildings are accessible to wheelchair users, however there are restrictive widths between the Tea Room and the Gift Shop. Registered disabled visitors are admitted at the reduced rate, their carer will be admitted free of charge. The pathways throughout the Farm are mainly concrete based however there are some areas which is compacted hoggin. This is suitable for wheelchair users, however it can be slightly difficult for those using frames and walking sticks. We offer a free of charge wheelchair loan (subject to availability). There is an outdoor play area which is on grass but during wet weather this area can be very slippery and muddy. Most of the animal pens allow wheelchair users close contact to the animals, however we stress that it is vital our hand washing facilities are used if anyone touches the animals. Due to the nature of our tractor and trailer ride, it is not suitable for wheelchair users or anyone suffering with spinal injuries. All our information signs are in bold type, with the yellow signs targeted at children and white signs for adult information. There are numerous hand wash facilities throughout the site as well as two main blocks of toilets, one which has disabled access and a quiet area for nappy changing or baby feeding. Our changing room facility consisting of ceiling hoist and track, height adjustable adult-sized changing bench and WC suitable for wheelchair users is accessible to all of our disabled visitors. A First Aid room is also available (keys can be obtained from our main reception). There is a Tea Room which provides pre-packed food with an extensive range of vegetarian and gluten-free products available. We aim to supply as much locally-sourced produce as possible, which is part of our ongoing commitment to local suppliers. Hot and cold drinks are on sale in this area and there are two microwaves available for visitors’ use (free of charge) to heat food or bottles. This area is accessible to wheelchair users; some of the benches provide room for wheelchairs to fit underneath. The kiosk in the outdoor play area will be opened on busier days (weather permitting) for the sale of ice creams, light snacks and drinks. Our staff are committed to providing each and every one of our visitors a memorable experience and will be happy to assist with all enquiries. All our staff our recognizable by the standard Longdown Activity Farm uniform. Most of our team have First Aid qualifications and are trained to assist in the event of any emergency on the Farm. Longdown Activity Farm are proud to be actively involved with training and employing adults with learning difficulties. We sincerely hope that you enjoy your visit to our farm. It is our aim to provide adequate facilities for each and every person, therefore we welcome any constructive feedback from our visitors.